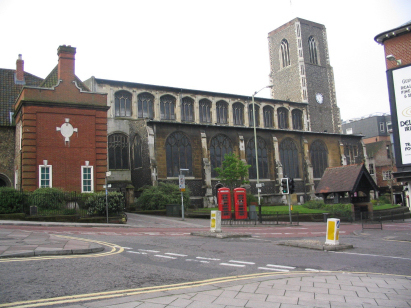 The parish of St Andrew, Norwich lies in the heart of the city close to the market place and the main shopping and business streets. During the period of this transcript this was very much a prosperous middle-class district of drapers, clerks and the "better" trades. Nowadays the population has decanted to the outside of the city and at night there are few who sleep in the area other than in flats and hotels. 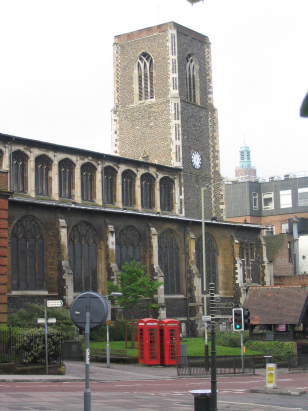 The parish is to the north of the main city area adjacent to the main east-west roman artery through the city on which so many of Norwich's churches lie. St Andrew is rare for a Norwich church i.e. one that is still used for worship. The church is large (only St Peter Mancroft being larger) and set in a raised position overlooking the plain across which lies St Andrew's & Blackfriars Halls. St Andrew's church is Perpendicular in its entirety a product of the 15th century (although there is evidence that an earlier church preceded the present one). The church has an exposed site to the north but all three other sides are deeply hemmed by mediaeval streets and their buildings making for a difficult photographing project. Two standard 1600-entry registers cover the period of the transcript, the first begun in 1813 was inexplicably abandoned incomplete in 1876, the second runs from 1877 through to the 21st century. The first register is filmed on Microfilm MFRO323B, this film is adequate to the task although the images are a little watery in places and also slightly out of focus, the second register deposited in 2013 is filmed on MFRO773 this film is a very recent filming and shows considerably improved images making it easy to read. The films were used to produce this transcript and subject to the caveats of poor imaging for the first register and the usual complaint of poor handwriting this was a straightforward transcript to prepare. It is to be hoped that few errors will have crept into its production.